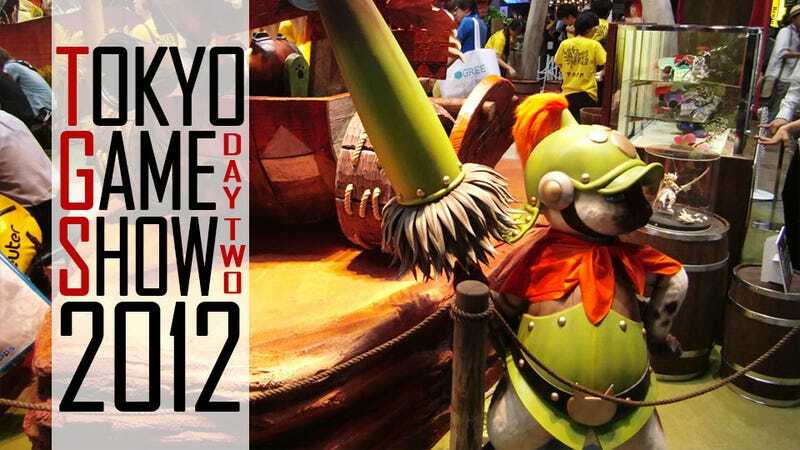 You've probably been seeing quite a bit of Tokyo Game Show news pouring in from our Kotaku East team. Rather than letting you sift through them yourself, here's a round up of day two to easily browse through. If you missed yesterday's showfloor news and impressions, we've rounded that one up, as well. Sakurasou no Pet na Kanojo (さくら荘のペットな彼女) is a novel series in Japan that is getting its own game for the PS Vita. A brief demo was on display at the Tokyo Game Show 2012. The Light Shooter is an experimental indie game from a Japanese developer named Kyosuke Yasumoto. This year's Tokyo Game Show has showcased many titles, but none of them has an ounce of the creativity shown in The Unfinished Swan. EX Troopers is an anime take on the world of Lost Planet. There's a 3DS version and a PS3 version. Today, I played both. Men in Spandex. Fighting. At the Tokyo Game Show. To promote its latest wrestling card venture, Japanese developer Bushiroad held, well, a live wrestling match at this year's Tokyo Game Show. This is a couple minutes of gameplay for Ninja Gaiden 3: Razor's Edge, the Wii U launch title that carves through dough-headed stooges like this and still can slice a tomato like this.